"This dessert is slightly exotic and is known by many people who have read the book 'The Lion, The Witch, and The Wardrobe'. This would do well for a tea party, a holiday party, or even if you just wanted to surprise someone." Bring 1 1/2 cups water, sugar, and corn syrup to a boil over medium-high heat in a large saucepan. Cook, stirring frequently, until the temperature reaches 240 degrees F (115 degrees C) on a candy thermometer. Set aside and keep hot. Stir together orange juice and orange zest, sprinkle with gelatin, and set aside. In a small bowl, dissolve cornstarch in 1/2 cup cold water, then stir into hot syrup. Place over medium-low heat, and simmer, stirring gently, until very thick. Remove syrup from heat, stir in orange juice mixture, vanilla, and pistachios. Sprinkle a 8x8-inch pan generously with confectioners' sugar. Pour the Turkish delight into the pan, and let cool in a cool, dry place (not the refrigerator) until set, 3 to 4 hours. When cool, sprinkle the top with another thick layer of powdered sugar. 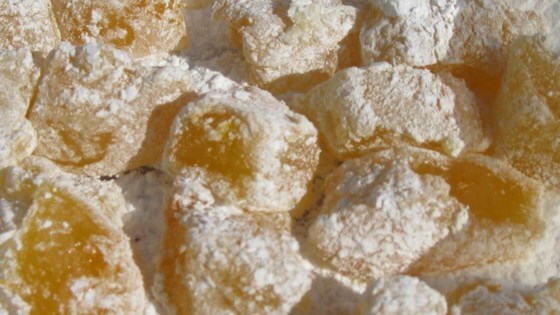 Cut into 1-inch squares, and dredge each well with confectioners' sugar. Store at room temperature in an airtight container.